A patient presenting with a primary complaint of upper jaw pain is challenging to diagnose and treat due to various possible etiologies and convergence of sensory afferents that may refer pain to that area. A differential diagnosis is necessary to identify potential symptom generators, to ensure that specific physical therapy treatment is rendered, and to provide optimal patient care. A 66 year-old female presented in the clinic with a four-week history of pain located along her right upper jaw. She pursued medical treatment by her dentist who referred her to an orthopedic physician, who then referred the patient for physical therapy. A comprehensive physical therapy examination was performed indicating pathology of the upper cervical spine. The patient was symptom free after six physical therapy sessions over the course of five weeks, which included: upper cervical spine mobilizations; therapeutic exercises; cervical and scapular stabilization exercises; soft tissue massage; postural education/body mechanics; and a home exercise program. This patient case demonstrated that treatment directed towards the upper cervical spine will affect symptoms of upper jaw pain. There is a close relationship between temporomandibular joint (TMJ) disorders and the upper cervical spine. In addition to jaw pain, patients who suffer from either pathology may have similar symptoms including: headache; ear pain; temple pain; tenderness of the jaw; and/or tenderness of the muscles in the head, face, or neck (Wiesinger 2009). 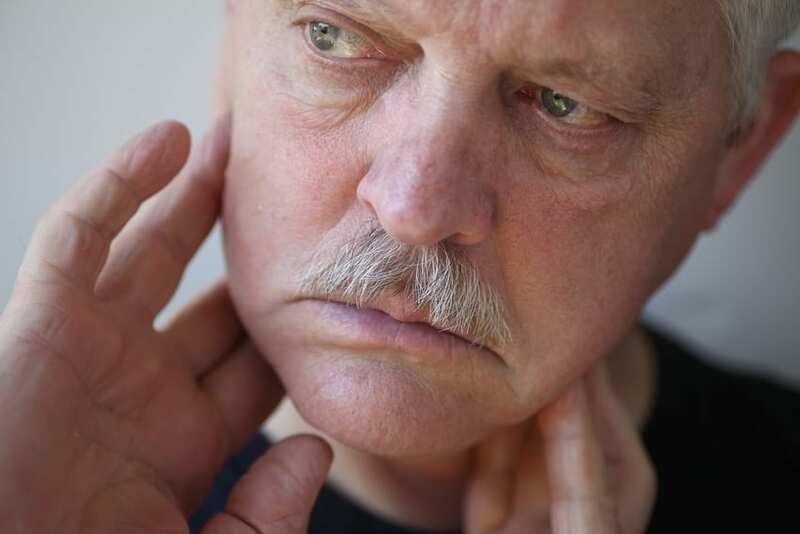 TMJ related jaw pain may be due to a variety of causes such as osteoarthritis, disc displacement, or myofascial pain. Jaw pain may also radiate from the upper cervical spine. The nuclei of the trigeminal nerve are located in cervical segments one through three. Afferent information from the spine travels in the same place as afferent information of the trigeminal nerve. These afferents converge; therefore a lesion of the cervical spine may have an effect on the trigeminal nerve and structures it innervates, resulting in pain perceived along the jaw (Capra 2007). In this case, TMJ etiology was ruled out and the patient’s symptoms in fact appeared to be radiating in nature from the cervical spine via the trigeminocervical nucleus. The following case study documents the examination, differential diagnosis, and successful management of a patient with a primary complaint of upper jaw pain. An orthopedic spine physician referred a 66 year-old female to physical therapy for evaluation and treatment of TMJ. The patient’s primary complaint was that of significant right upper jaw pain. She reported a four-week history of constant pain rated 4/10 at best and 8/10 at worse, on VAS. She could not recall any specific trauma or event that caused her symptoms. She stated that her symptoms began gradually. Upon further questioning, the patient recalled that five months prior she had noticed a gradual onset of right sided head and neck pain in the suboccipital, temporal, and mastoid areas. She did not originally recall these symptoms because they had been minor in comparison to her main complaint of upper jaw pain. Furthermore, her head/neck symptoms did not occur independently of her jaw pain. The patient reported that her symptoms increased with turning her head in either direction, with quick movements of her head, while sitting at the computer, while reading, while driving, with child care, and with housework. She reported difficulty holding her head up for periods of time. The patient stated that symptom relief occurred with rest and avoidance of aggravating factors. Symptom relief also occurred within 12-24 hours of onset. The patient denied symptoms of: sensitivity to light or sound; nausea; vomiting; loss of balance; dizziness; numbness; parasthesias; tinnitus; jaw clicking; jaw crepitus; difficulty eating; and difficulty chewing. The patient was retired, although active. She was responsible for regular upkeep of her home including cooking and cleaning; babysitting her infant grandchild; recreational activities included golf and bowling. Diagnostic exams were not performed at this time. PMH: C4-7 fusion one year prior. Outcome questionnaires were given to the patient and were as follows: 1.TMJ Disability Index (TDI): 0 (no disability); 2. Neck Disability Index (NDI): 16% (0-20= minimal disability, 20-40 = moderate disability, 40-60 = severe disability, 60-80 = crippled, 80-100= bed bound or exaggerating); 3. Headache Disability Index (HDI):8 (2-32 = Mild, 33-59 = Moderate, 60 + = Severe). The patient’s history, especially in light of reported head and neck symptoms upon further questioning, suggested cervical spine pathology. The goal of the clinical examination was to identify the pain generating structure(s). Since cervical spine pathology was suspected, a cervical spine clinical examination was performed in addition to TMJ testing. The physical therapy examination consisted of the following: postural assessment; neurovascular testing; stability testing; provocation testing; mobility testing; motor examination; and deep neck flexor endurance test. The patient presented with moderate forward head posture in static positions and a mild increase in thoracic kyphosis when visualized in the sagittal plane. There was no deviation of the head, neck, or jaw when visualized in the frontal plane. Her upper trapezius region appeared to display increased tone bilaterally and was tender to palpation equally. She was negative for tenderness along the masseter and temporalis muscles and negative for tenderness at the temporomandibular joints. She did have tenderness of the suboccipital muscles bilaterally and on the right lateral aspect of the segments of C0-1 and C1-2. Patient was negative for joint crepitus upon mouth opening and closing. The patient’s sensation was intact as she was tested for light touch and pin prick throughout her face, including the three divisions of the trigeminal nerve, and upper extremities. The patient’s deep tendon reflexes including triceps, biceps, and brachioradialis were 2+ bilaterally. Jaw reflex was unremarkable and Hoffman reflex was absent. Vetebrobasilar insufficiency testing was negative. The results of transverse ligament of atlas test and the alar ligament test were unremarkable. Examination of jaw movements revealed that active motions including mouth opening, mouth closing, protrusion, and retrusion were normal, symmetrical, did not reproduce symptoms. Examination of lower cervical spine movements revealed an equal bilateral limit without reproduction of symptoms with rotation and sidebending, and a mild limitation of extension without reproduction of symptoms. Examination of the upper cervical spine revealed the following: reproduction of symptoms with protraction with left rotation; retraction with right sidebending; and retraction with right rotation. In addition, the patient presented with a limit of motion of retraction with right rotation and retraction with right sidebending when compared to the other left side. Examination of the upper cervical spine revealed hypomobility of the right C0-1 dorsal capsule and the right C1-2 dorsal capsule. Hypomobility of these segments play a role in the location of symptoms as described by the patient. Therefore, it is important that the mobility of these segments are addressed in the patient’s treatment plan. Cervical flexion, extension, bilateral rotation and bilateral sidebending were strong and pain free. Bilateral shoulder abduction, adduction, internal rotation, and external rotation were strong and pain free. Elbow flexion, elbow extension, wrist extension, wrist flexion, thumb abduction, and pinky adduction were strong and pain free. Scapular musculature was assessed at 3+/5 bilaterally. Scapular and shoulder range of motion during arm elevation was within normal limits and pain free. The deep neck flexor endurance test was utilized to objectify the patient’s strength and endurance of the longus capitus and coli musculature (Domenech 2011). These muscles are necessary to support the cervical lordosis and motion segments. Patients who have neck pain have been demonstrated to present with decreased strength and endurance of these muscles resulting in decreased neuromuscular control, and altered movement strategies (Jull 2008). The patient scored 7 seconds on this test without pain; the test was concluded when she was unable to hold the position correctly. The interpretation for this test is that healthy males are able to maintain the chin tuck head lift position for approximately 38 seconds, whereas females are able to maintain this position for approximately 29 seconds (Domenech 2011.) This test is illustrated in Figure 1. Please note that lines have not been drawn on the patient as described in the article; these skin folds were visualized by the physical therapist. Figure 1: The physical therapist’s stacked index and middle finger are placed under the occiput. The patient is instructed to maximally tuck chin and then slightly lift head. The patient must be able to maintain the chin tuck while the head is lifted; however, still in contact with the therapist’s fingers. The timer was stopped when the patient could no longer maintain the correct position. Hypomobility of the dorsal capsule of right C0-1 and right C1-2 segments. Decreased strength and endurance of craniocervical flexors and scapular musculature. The prognosis was good for the patient to return to movement and activities with symptom relief. Her symptoms of jaw pain had not been present for too long; although her complaints of head and neck pain were chronic in nature. Irritability of symptoms was not an issue and the patient had remained functional with daily activities. Lastly, the outcome questionnaires indicated mild disability for neck pain and headache. Education in proper posture and body mechanics, including: correct lifting/carrying of granddaughter; sitting at computer, ergonomic set up at computer, and taking rest breaks while sitting at computer; performing household activities such as cleaning and cooking. Utilize soft tissue techniques of cervical paraspinals, anterior scales, and upper trapezius muscles. Utilize segmental mobilization techniques at right C0-1 and right C1-2 to improve upper cervical range of motion. Utilize longus coli training to improve deep neck flexor endurance. The patient was treated in the clinic for 6 physical therapy sessions over a 5-week period. During the initial examination, the patient was provided with an explanation of examination findings and interventions that would be utilized. She was educated on the importance of correct body mechanics in general, such as chin retraction, shoulder retraction, and recruitment of tranverse abdominis. She was instructed on proper positioning while seated at her computer, maintaining previously stated posture as well as positioning the keyboard and monitor in closer reach. She was instructed on how to correctly lift and carry her infant grandchild and she was instructed in proper body mechanics with household activities. A home exercise program was issued at this initial visit which consisted of three exercises described in Table 1. The patient was also instructed in a walking program. Each session began with a warm up on the upper body ergometer for five minutes in a retro direction. Manual therapy techniques were performed after the warm up. First, transverse friction massage was used and targeted bilateral upper trapezius and anterior scalene musculature. Also soft tissue massage was performed for the suboccipital muscles. Next, local traction was applied at the right C0-1 segment for pain relief. This is illustrated in Figure 2. Local traction was performed at end range for four sets of 40 seconds. Figure 2: C0-C1 Traction. The therapist sits on the right side of the patient. The cranial arm cradles the patient’s head while the caudal hand performs the mobilization. The radial aspect of the index finger is placed under the patient’s mastoid process. The patient is prepositioned in slight sidebending towards the therapist and rotation away from the therapist. The mobilization force is applied in a cranial, and slightly medial direction. Manual therapy techniques were used to address joint restrictions of the right dorsal capsules of C0-1 and C1-2. These three dimensional unilateral techniques were performed at end range, for four repetitions at 40 second holds. Figure 3 demonstrates C0-C1 unilateral upper cervical flexion mobilization and Figure 4 demonstrates C1-C2 upper cervical flexion-rotation mobilization. Figure 3: C0-C1. Unilateral upper cervical flexion mobilization. The therapist stands on the opposite side to treated with the cranial hand cupped under the occiput and the caudal hand stabilizing C1. The patient is prepositioned in upper cervical flexion, rotation away from the therapist and sidebending toward the therapist. The mobilization is applied at end range and directed in a dorsal, cranial and slightly lateral direction. Figure 4: C1-C2. Upper cervical flexion-rotation mobilization. The therapist stands on the side opposite to be treated. The cranial hand cups the occiput and C1 while the caudal hand stabilizes C2. The direction of the mobilization is applied in the horizontal plane directed dorsally. Therapeutic exercises, stabilization exercises, and stretches were incorporated into the patient’s treatment program and are listed in Table 1. The deep neck flexors were targeted with a chin tuck exercise in supine and also a functional exercise in standing which is depicted in Figure 5. She was instructed to hold each position for ten seconds. Figure 5: The patient is instructed to first lean against the foam roll, which is placed against the wall, so that it rests along the patient’s spine. The patient then slightly bends her knees, places her hands inside her hip bones and pulls her belly button in towards her spine. She then retracts her shoulder blades, and performs a chin tuck. These exercises were progressed by adding a head lift to the chin tuck exercise and adding arm movements to the functional exercise. The patient was instructed to stretch the anterior shoulders and chest by utilizing the foam roll in a supine position as depicted in Figure 6. Figure 6: The patient lies with the foam fool along her spine. Her head is in a chin tuck position while she recruits transverse abdominis. The patient holds her arms outstretched for a total of thirty seconds, three repetitions. Table 1 lists the specific therapeutic exercises and stabilization exercises with dosages. The patient was progressed with weights, resistance bands, perturbations, and positions. Pt. was educated on the importance of correct body mechanics in static positions, such as chin retraction, shoulder retraction, and recruitment of transverse abdominis. She was instructed on proper positioning while sitting at the computer, maintaining previously stated posture as well as positioning keyboard and monitor in closer reach. She was instructed on how to correctly lift and carry her infant grandchild and she was instructed in proper body mechanics with household activities. 3. Chin tuck: in supine, gently nod head so as to bring chin towards throat, Hold 10 seconds, perform 10 repetitions, 2 sets, for 2 sessions per day. The patient received six physical therapy treatments over a five-week period. The patient stated that the intensity of her jaw pain had decreased within the first two visits and she reported resolution of jaw pain at her third visit. She stated that her home exercise program and compliance with correct posture and body mechanics contributed to her improvements. Over the next third and fourth visits she reported an increase in neck mobility, although that was not her original complaint; however she was surprised that she felt much better than she had in the past, even prior to the onset of jaw pain. On her fourth visit she reported a decreased intensity and frequency of head/neck and temporal pain. On this visit, symptoms were no longer reproduced with provocation testing of the upper cervical spine, namely protraction with left rotation, retraction with right sidebending, and retraction with right rotation. At her 6th visit, which was 5 weeks after initiating physical therapy, she was happy to report resolution of headaches and neck pain. Her deep neck flexor endurance test had increased to 25 seconds; her upper cervical spine mobility was within normal limits; she was able to maintain correct posture; she had decreased soft tissue restrictions; and the strength of scapular stabilizers had improved. The patient’s Neck Disability Index score was 2%, which had improved by 14%. The patient’s Headache Disability Index was 2 which had improved by 6 points. The patient was contacted 2 months after concluding physical therapy; at that time she reported resolution of symptoms and had continued to perform her home exercise program daily. The patient’s symptoms of right jaw pain led her to seek medical treatment. This is the most common symptom of patients diagnosed with temporomandibular disorders (La Touche 2009). This is what most likely led her physician to diagnose her with TMJ. Upon further questioning during her physical therapy examination, the patient reported symptoms of right suboccipital pain and headache which extended to into her right temporal region. Pathology of the temporomandibular joint and of the cervical spine must be considered when evaluating patients with these symptoms. Various structures can cause these symptoms including the temporomandibular joint, the masticatory muscles, and/or the upper cervical spine segments. Furthermore, testing must rule out red flags and serious pathology. A differential diagnosis was crucial in determining the patient’s symptom generators and providing an appropriate comprehensive treatment plan. The clinical exam ruled out TMJ dysfunction and myofascial pain dysfunction. The patient was negative with provocation tests and had no limitations in jaw movement. Additionally, she did not present with joint sounds or crepitus with testing. Lastly, she was negative for tenderness of the masticatory muscles and had no trigger points. Based on these findings and the Research Diagnostic Criteria for TMD, it was concluded that the patient did not present with TMD as the source of her symptoms (Ozkan 2011). The patient did present with deficits when performing the upper cervical spine clinical examination indicating which structures may be the source of her symptoms. The patient had positive findings with provocation testing of the upper cervical spine as well as decreased joint mobility in the upper cervical spine. Not only did such findings explain the patient’s neck pain, but also the patient’s head pain and jaw pain. Referred pain into the head and jaw from the cervical spine occurs via the trigeminocervical nucleus. The nuclei of the trigeminal nerve are located in cervical segments one through three. Afferent information from the spine travels in the same place as afferent information of the trigeminal nerve. These afferents converge; therefore a lesion of the cervical spine may have an effect on any branches of the trigeminal nerve and structures innervated by it (Capra 2007). In many cases like this, pain originates in the neck and radiates to the front of the head over the ear, and to the upper aspect of the mandible and zygomatic area (Vincent 2010). Other deficits may have contributed to the patient’s condition. Upon visual inspection, she demonstrated a forward head posture. This type of posture causes increased loading on the structures of the cervical spine and irritation resulting in pain (Mun Cheung Lau 2010). This was addressed with education on proper posture and body mechanics with different positions and activities. Additionally, the patient demonstrated a low score with the Deep Neck Flexor endurance test. (Domenech 2011).The deep neck flexors are critical in supporting the cervical lordosis and cervical segments. Initially she was instructed on a supine chin tuck and also a functional exercise similar to that described by Beer (Beer 2012). The latter exercise addressed the deep neck flexors in a functional position of standing. The patient was instructed to maintain an upright posture, using a wall for tactile cues. She was instructed to not only perform a chin tuck with scapular retraction, but also recruit transverse abdominis musculature. She was instructed to hold this position for at least 10 seconds. Not only is this position functional, but convenient so as to make it easier for the patient to perform throughout the day. Performing increased amount of repetitions of this exercise allows for improvement in motor learning. Providing the patient with verbal and tactile cues when performing this exercise has been shown to allow better recruitment of correct musculature (Beer 2012). The patient demonstrated deficits in strength and endurance of scapular musculature. Therefore, she was instructed in progressive muscular strengthening and stabilization exercises. These exercises varied in positions including supine, prone, and weight bearing; varied in use of weights, resistance bands, and gravity; and also incorporated unstable surfaces and/or perturbations to the body. A comprehensive treatment plan to include manual therapy, therapeutic exercise/stabilization, and postural education proved to be beneficial in addressing the patient’s symptoms as she obtained symptom relief at the conclusion of 6 sessions and remain symptom free 2 months later. Patients who are diagnosed with TMD require a comprehensive physical therapy examination including upper cervical spine testing. In this case, the TMJ exam was unremarkable; however, the upper cervical spine exam was essential in establishing a differential diagnosis. A differential diagnosis is critical in formulating patient specific interventions and providing optimal patient outcomes as demonstrated with this case study. 1. Becker, W. Cervicogenic Headache:Evidence That the Neck is a Pain Generator. Headache; April 2010: 699-705. 2. Beer, A et al. Can a functional postural exercise improve performance in the cranio-cervical flexion test? A preliminary study. Manual Therapy. 2012; 17: 219- 224. 4. Capra,N, et al. The influence of pain on masseter spindle afferent discharge. Arch Oral Biol. 2007 April ; 52(4): 387–390. 5. Domenech, M et al. The deep neck flexor endurance test: normative data. PM&R. 2011 Feb; 3(2): 105-110. 6. Jacobson, G et al. The Henry Ford hospital headache disability index (HDI). Neurology. 1994; 44: 837-842. 7. Jull, G et al. Clinical Assessment of the Deep Cervical Flexor Muscles:The Craniocervical Flexion Test.Journal of Manipulative and Physiological Therapeutics. September 2008: 525-533. 8. La Touche, R et al.The effects of manual therapy and exercise directed at the cervical spine on pain and pressure pain sensitivity in patients with myofascial temporomandibular disorders. Journal of Oral Rehabilitation.2009; 36: 644–652. 9. Manfredini, D et al The diagnostic process for temporomandibular disorders. Stomatologija, Baltic Dental and Maxillofacial Journal. 9: 35-39, 2007. 10. Mello, C et al. Temporomandibular disorders in headache patients. Med Oral Patol Oral Cir Bucal. 2012 Nov 1;17 (6):1042-6. 11. Mun Cheung Lau, H. Measurement of craniovertebral angle with Electronic Head Posture Instrument: Criterion validity. JRRD. 2010; 47 (9): 911-918. 12. Ozkan, F et al. The relationship of temporomandibular disorders with headaches: a retrospective analysis.Agri. January 2011; 23(1):13-17. 13. Page, P. Cervicogenic headaches: an evidence led approach to clinical management. International Journal of Sports Physical Therapy. September 2011; 6 (3): 254-266. 14. Steigerwald D, et al. The Steigerwald/Maher TMD Disability Questionnaire. Today Chiro 1997;26:86-91. 15. Vernon, H et al. The neck disability index a: study of reliability and validity. J Manipulative Physiol Ther.1991; 14: 409-415. 16. Vincent, M. Cervicogenic Headache: A Review Comparison with Migraine, Tension-Type Headache, and Whiplash. Curr Pain Headache Rep. 2010; 14:238–243. 17. Wiesinger, B et al. Does a dose-response relation exist between spinal pain and temporomandibular disorders? BMC Musculoskeletal Disorders. 2009; 10 (28): 1- 8. 18. Winkel D. Differential Diagnosis of the Spine: Nonoperative Orthopeadic Medicine and Manual Therapy.PRO-ED, Inc; 1996.